Our family comes from a long heritage of duck hunters. 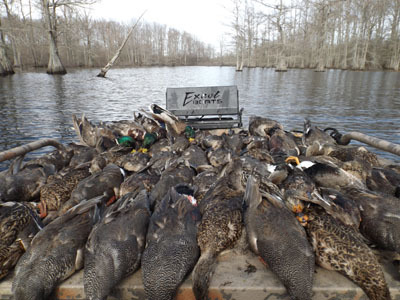 My father started duck hunting in his teens back in the mid 1950’s when the Mississippi Delta was truly blessed with a great abundance of Mallard, Gadwall, Widgeon and Wood Ducks with an occasional Black Duck in the drove. In my 50 years of duck hunting I have had the pleasure of hunting with guest from the east coast to the west coast and from Canada to the gulf coast. My sons, son in law, grandsons and nephews are all avid duck hunters. Having grown up hunting the renowned Mathews Brake located in Leflore County Mississippi we have learned to appreciate the use of a top quality duck tote. The “Beast” duck tote, “Cowboy” duck tote, “Sugar Man” duck tote, “Trace” duck tote, and “Buddy” shell belt are named after each of my grandsons with each matching characteristics of them. I hope you enjoy using our lanyards and totes while spending quality time in the majestic outdoors that our glorious God has provided.